Heavy Naphtha cut from the atmospheric crude oil distillation column in a refinery is sent to a ‘Naphtha Hydrotreating Unit’. After the naphtha hydrotreating unit, naphtha is sent to an isomerisation unit or a catalytic reformer unit, which often use reforming catalysts. Most reforming catalysts contain platinum as the active material. Sulfur and nitrogen compounds present in naphtha cut from atmospheric distillation column can deactivate the catalyst and must be removed prior to catalytic reforming. Purpose of the naphtha hydrotreating unit is to remove sulphur and nitrogen compounds. The naphtha hydrotreating unit uses a cobalt-molybdenum catalyst to remove sulfur by converting it to hydrogen sulfide that is removed along with unreacted hydrogen. 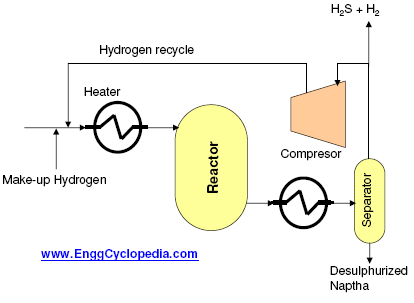 Some of the hydrogen sulphide-hydrogen mixture is recycled back to the reactor to utilize the unreacted hydrogen, using a compressor. Reactor conditions for naphtha hydrotreating unit are around 400-500˚F (205-260˚C) and pressure of 350-650 psi (25-45 bar). As coke deposits on the catalyst, reactor temperature must be raised. Once the reactor temperature reaches ~750˚F (400˚C), the unit is scheduled for shutdown and catalyst replacement. 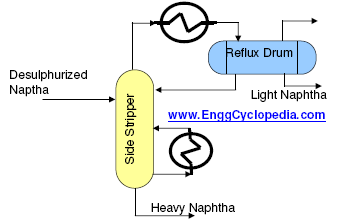 If required, the boiling range of the catalytic reforming charge stock can be changed by redistilling in the naphtha hydrotreater in a stripper as shown in Figure-2. Often light naphtha containing pentanes, hexanes and light naphtha are stripped off and sent directly to gasoline blending or pretreated in an isomerization unit prior to gasoline blending. The heavy naphtha from the bottom of the stripper column goes back to the catalytic reformer unit before blending with gasoline.